3.1 Update is finally here! To celebrate the Update, we prepared a Special Log In Event! Claim Attack Transcendent Summon Stone & Loyal Transcendent Summon Stone upon logging in! 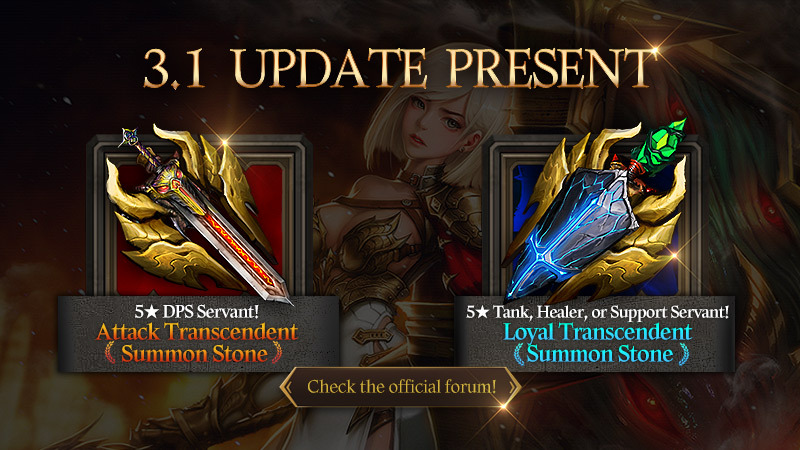 Log in and receive 1 Attack Transcendent Summon Stone & 1 Loyal Transcendent Summon Stone! > You must log into the game to claim the reward. > Rewards will be issued only once per account. > Rewards will be sent to your Mailbox and expire after 7 days. Last edited by CM_Heylel; 03-25-2019 at 07:07 PM. Did not get the event items. I did not receive the event items on my account. Please try restarting/reinstalling your Heir of Light again. If the problem remains, please contact our customer support with information about your account and device so that we can investigate this issue further.